Two months ago, we brought you the proposal for the “Low Line,” an awesome underground park located in the abandoned Essex Street trolley terminal under Delancey Street in the Lower East Side. 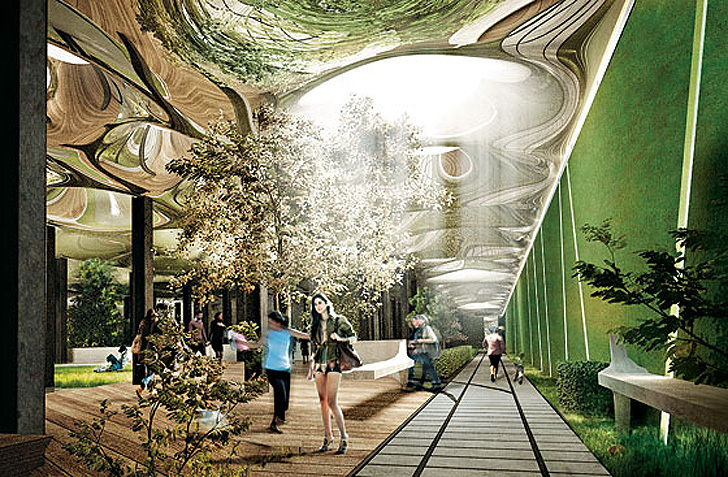 Designed by architect James Ramsey, the principal of RAAD, in part with Dan Barasch of tech think tank PopTech, the park, which calls for pumping natural sunlight into the subterranean space with fiber optics, looked to many to be too out there and unrealistic. But the proposal for the Delancey Underground seems to have piqued the interest of the MTA, who recently released a fantastically interesting video tour of the station. Led by Peter Hine, a senior project manager for the MTA’s Real Estate Department, the tour gives a history of the space and conveys the MTA’s excitement over the creative possibility’s for the terminal’s restoration. The Essex Street terminal dates back to 1903, when it opened at the same time as the Williamsburg Bridge, and it ceased to operate in 1948. The tour takes you literally right into the middle of the empty trolley station, which is directly adjacent to the in-service tracks of the Essex Street subway station. The designers of the Delancey Underground have proposed a financing system similar to that of the High Line, meaning that it will be funded by private donors. While they have no high-powered supporters on board just yet, Ramsey and Barasch are in full fundraising mode, and the MTA’s video will no doubt help their cause. “We look forward to making this remarkable space, as well as many other conventional and unconventional spaces, throughout the entire MTA system available for creative development and revedevelopment soon,” says Hines. Two months ago, we brought you the proposal for the "Low Line," an awesome underground park located in the abandoned Essex Street trolley terminal under Delancey Street in the Lower East Side. Designed by architect James Ramsey, the principal of RAAD, in part with Dan Barasch of tech think tank PopTech, the park, which calls for pumping natural sunlight into the subterranean space with fiber optics, looked to many to be too out there and unrealistic. But the proposal for the Delancey Underground seems to have piqued the interest of the MTA, who recently released a fantastically interesting video tour of the station. Led by Peter Hine, a senior project manager for the MTA's Real Estate Department, the tour gives a history of the space and conveys the MTA's excitement over the creative possibility's for the terminal's restoration.